Cuts or rashes on the skin:- These could cause irritation on the skin when in contact with water. Slipping in the tub(while trying to sit or stand). Soap getting into the eyes. Swallowing or choking on water. Coming in contact with water that is either too hot or too cold. Delay in wiping water from the face. Sudden awareness of her environment :- From experience, according to Dr.William Sears, if a toddler newly develops awareness of her environment, she might get scared by the sight of little things such as water going down the drain.Somehow, she believes she could also be sucked into the drain. Even the sound of water going down the drain might scare her. Phobia for hair washing during bath time :- Toddlers generally dislike when water flows over their faces and this happens mostly when the hair is washed. In any case, there are tips that when adopted by the mother,aims at helping the toddler gradually overcome the toddler’s fear of taking bath. Guard against slipping by installing decals(decorative stickers) at the bottom of the bath tub. Always test the water to insure it’s not too hot or too cold and the temperature is just right. Guard against bumping into the faucet by covering it.Try wrapping it with a cloth. You can use plastic visors or swim goggles to prevent soap from getting into the eyes.Quickly wipe water from the face to avoid choking. For fear of hair washing, cut the hair if it’s too long to quickly curb this fear. But as an alternative, try using mild shampoo. If the child is older or has very curly hair that tangles and delays washing, you can cover the baby’s head with shower cap. Patience : Patience is a very important when dealing with the child’s fear of taking bath as it is easy to get exhausted and start forcing the child’s bath and causing stress in the process. Start with a spondge bath :- The process of reintroducing the toddler to the bath tub should be gradual and this can be achieved by using spondge bath for a start. This can be done either in the bath tub, beside it or on a towel. Take it slow by sitting her first on the empty bath tub,adding water as she gets used to it before putting her in the tub. Changing hands(Getting someone else that is close to him to do the bathing) . Changing bath time can make it more interesting as well as bathing with the baby. 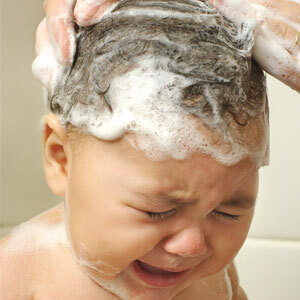 Try bathing the baby with a sibling that can distract her attention from the water. You can also calm her down by splashing the water from the bath tub onto your skin, consequently showing the baby that it is completely harmless. Entice the baby with fun : Try putting her favorite toy into the water. She might try to save it, which will entice her into bathing again.But if putting her favorite toy in the tub brings a negative reaction like more tears,try another alternative by putting colorful toys into the bath tub first without water and then start adding water gradually when she’s inside. Also, try blowing bubbles to interest or calm her down and then get a sibling or someone else in the house to continue blowing the bubbles to distract her attention from the water so that before she knows it, bath time is over. Finally, most causes are generally discovered by observation and common sense and a general solution is to avoid a repeat performance of the incident that triggered the child’s fear so that she can be splashing hapilly in the water once again.